Holidays on cruise ships are becoming more and more common for families. But if you’re planning on cruising with a baby there are some essential things you need to know. Our first family cruise was booked when our youngest daughter was just seven-months-old and we set sail when she was 13-months. In-between I had a 101 questions in my head about how baby-friendly cruise ships were. What baby equipment would be available on board? Could I get nappies on a cruise ship? And would our little one be able to go to the kids club? When can you cruise with a baby or bump? Are baby supplies available at sea? Do cruise ships have baby-friendly food? Are shore excursions suitable for infants? Will your water baby be able to swim? How do you do baby laundry at sea? Are cots and high chairs available on cruise ships? Can you bath a baby on board? 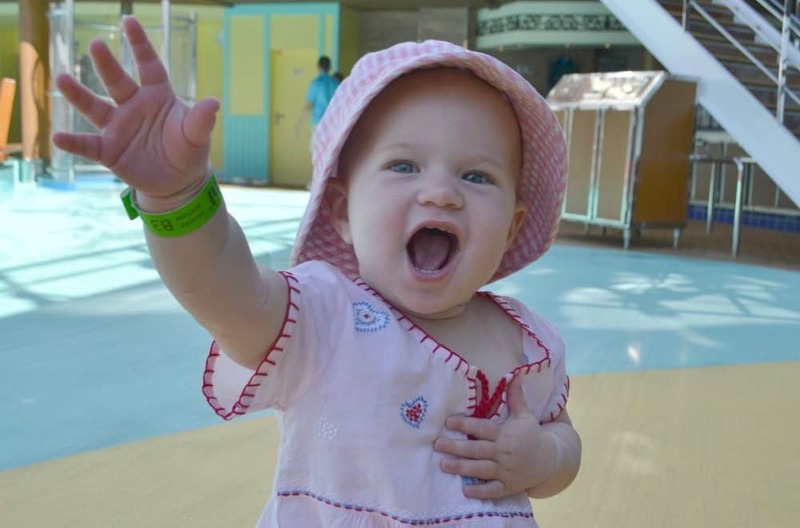 Can babies go to kids clubs on cruises? Is cruising with a baby worth the hassle? Cruises holidays are a significant investment so it’s likely you’ll be booking yours in advance to break up the cost. If you fall pregnant in the nine to 18 months before your cruise then it may affect your ability to travel. Cruise lines like Royal Caribbean, P&O Cruises, MSC and Disney do not allow cruising with infants under the age of six months. 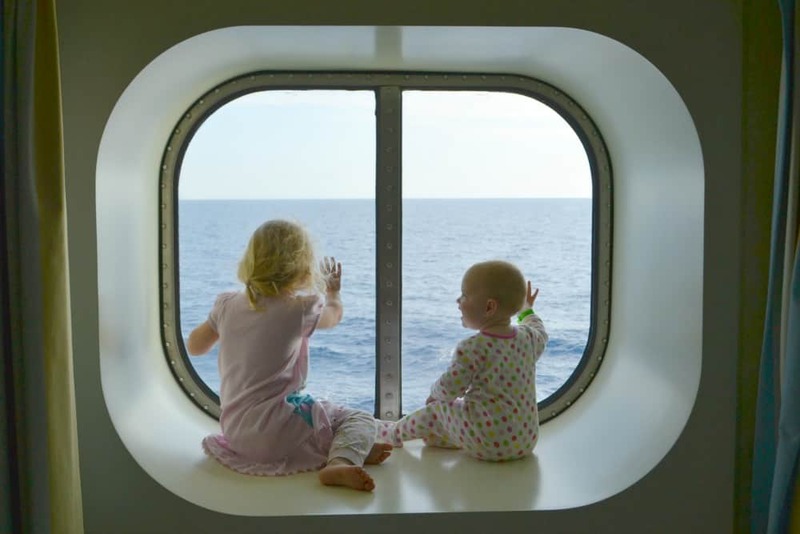 If you are going transatlantic, or have more than three days at sea, your tiddler will need to be 12-months-old on the first day of your cruise. Also check with your cruise line if you are planning on travelling beyond 24 weeks pregnant. Baby essentials like nappies, wet wipes, formula milk and baby food are not stocked by cruise ship shops. So it’s important you top up these items while you’re in port. Always carry more than you would usually need to be on the safe side. If your baby is weaning you’ll find plenty of finger food in the buffet. Pasta, vegetables, cooked meat, fruit and cheese are all standard buffet fare. If you prefer to serve your weaning baby pureed food then bring your own mini hand-blender, or pre-prepared food pouches and jars. Speak to your shore excursion team about the most family-friendly days off the ship. Some excursions will involve long coach journeys or lots of walking in large groups, which can be challenging with babies and young children. Consider what you can do within easy reach of the port and opt for half day excursions so you can factor in essential nap and meal times. If your young children are not potty trained then they will not be allowed to bathe onboard the majority of cruise ships. This is to limit the spread of infectious bugs. Disney and Royal Caribbean are among the cruise lines that have some ships where babies can enjoy a dip in a splash park or special children’s pool. Read more about our Royal Caribbean cruise. Poo-namis happen, so it’s best to be prepared. There may be a few options open to you when your little love soils their last playsuit. If you’ve thought ahead you’ll have brought your own detergent so you can wash items in your cabin sink. If not, make arrangements with your steward for your washing to be done for you; or, if available, use the passenger laundry room. These are small, so avoid them on a sea day as you could get caught in a queue. MSC have a special baby laundry service onboard, which uses a different machine and gentle detergents – ideal for sensitive baby skin! Read more about family cruises with MSC. Travel cots are available on cruise ships. Just make a request to have one in your cabin when you book or get in touch with your cruise line before you sail. Linen was provided for us on our Carnival cruise but we brought along Baby’s usual sleeping bags to keep her tucked in. You’ll also find high chairs in the dining rooms on family-friendly ships. Showers are more common in staterooms than baths. If your baby doesn’t get on with them line your suitcase with a baby bath or washing up bowl. Check the specifications of your room or contact your cruise line so you know exactly what you’ll find in your WC. Packing your baby off to a kids club might be the dream for many tired parents but you may find not all activities or sessions are open to infants. Two-years-old is the minimum age on Carnival and P&O Cruises. Norwegian Cruise Line have play sessions for children aged six months to three-years-old, supervised by their parents, as do MSC for children up to the age of two. MSC also offer baby-sitting for children over one-year-old. Disney Cruises have the ‘gold standard’ in baby care with a bookable nursery for mini-cruisers from six-months-old. If you have any specific questions about cruising with a baby comment below or get in touch. You can also read more about cruising with children of all ages on the Cruising With Kids website which I also edit with a team of other cruise-happy mum bloggers. 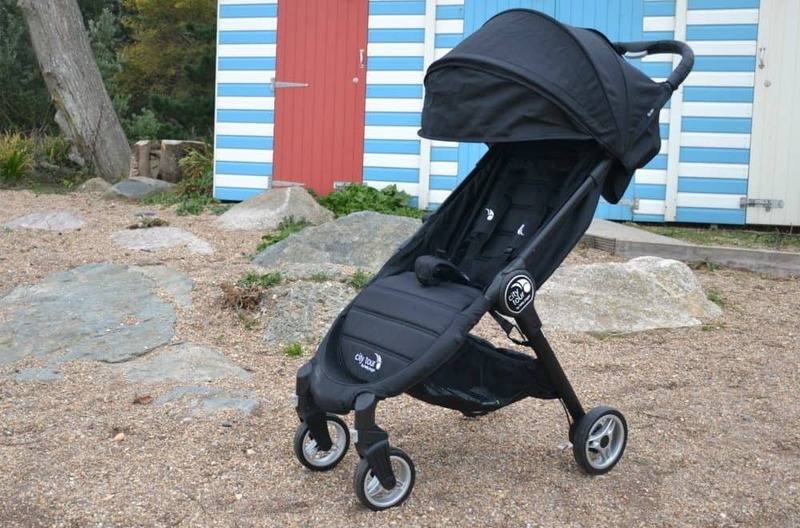 Want to find out what it’s like cruising with a baby? Read about our first family cruise. And if you have slightly older kids you might like to see how we got on during our cruise with a three-year-old and a five-year-old. Thank you Claire for your very thorough post on Cruising with baby. I definitely did Not know there were so many rules and restrictions. I’m glad to hear you were able to enjoy a cruise with baby AND toddler. Did your feel the cruise staff was receptive and helpful towards your children? Hi Claire, thanks for all that info you have put together…..only wish I had read it sooner. When on the Marella Discovery we were very pleased with the provision for babies and children, apart from one issue. The travel cot that we were told would be provided as standard for all infants under two years did not fit in the cabin safely. A two seater sette took up the only available space. The settee could not be removed from the cabin. So it was left for us to try and get the settee up on its side and squeeze the cot in and have it protruding outwards into the cabin….not an ideal situation and it was quite distressing. Several bruises were collected during our two weeks on board. TUI not sympathetic or helpful in this instance. A notice for parents expecting room for travel cot.